On An Overgrown Path: Free music - so what's new? Free music - so what's new? 'Music industry finds the solution to its pirate troubles - give everything away' - screams a Guardian headline. Sorry folks, but the classical sector has been giving away music for years. Here from my current Visa bill are the prices I paid for CDs online recently including delivery: Messiaen Des canyons aux étoiles (2CDs) - £4.00, Dallapiccola choral works - £3.41, Stockhausen piano works - £4.22, Elgar Dream of Gerontius (2CDs) - £5.67. It actually gets worse in the stores. Just last week I bought 10CDs of Thomas Tallis' complete works in recordings made as recently as 2004 for £3 a CD, and that wasn't discounted. In HMV stores you can currently pick up 14CDs of the complete Mahler symphonies by classical music's premium brands, Simon Rattle and the Berlin Philharmonic, for £1.79 a disc. That means a Mahler CD from our industry's most prestigous band now costs less than a cappuccino, and it's not expanding the market for classical music or filling concert halls at all. So with prices already at rock-bottom what will be the impact of free downloads from Qtrax and others? Classical music will become just another disposable commodity. Download it, give it a quick listen, it doesn't appeal on first hearing? No problem, delete it and try again. Contemporary composers had better start thinking catchy, and record companies (if any survive) had better start thinking instant gratification. So what does a dead composer (European to boot) know about today's market with its MP3s and iTunes? The answer is a lot. Britten wasn't just a composer, he was a musical polymath whose vision created one of the few successful, and growing, classical music communities in the world. Last year Aldeburgh Music sold 91,000 tickets. I wonder how many bargain basement Berlin Philharmonic Mahler boxes EMI has sold in the UK - 5000 perhaps? The solution for the music industry isn't to give everything away. It's the opposite. Think added value, think Glossa, think Soli deo Gloria, but above all think Alia Vox. Now playing is Jordi Savall's newly released Francisco Javier 1506-1553, the Route to the Orient on Alia Vox. Yes, it comes with 2CDs of lovingly researched and performed music, but there is much more in the form of a 273 page colour book (cover above) which is a work of art in itself. 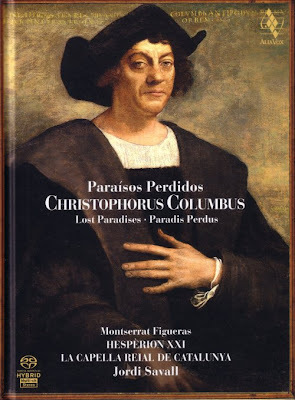 In it there are fascinating and scholarly articles ranging from early music performance, to Erasmus of Rotterdam, Niccolo Machiavelli, Thomas More, and Martin Luther, as well as Francisco Xavier, who was an early Jesuit missionary, himself. And the whole package is worth far more than the sum of the parts. I paid £30 for it in Prelude Records in Norwich, and that is the best £30 I have spent on recorded music for a long time. I didn't get two CDs for my money, I got a unique musical experience. And that is what will rejuvenate the market, not giveaways. Britten would have approved. The Route to the Orient is about as far from instant gratification as you can go. It demands preparation by reading the book, and it also demands effort to understand the non-Western music that it explores. You must leave your computer and take a journey to a special place called an independent record store to buy it, and you will also need to save up as it is not available online at a discount or as a download. The thoughtfully planned multi-cultural programme needs to be understood, and clarification of the ears and sharpening of the instincts are definitely needed for close encounters with instruments such as the shinobue, nokan, sarod and shakuhachi. Are added value projects like Francisco Javier, the Route to the Orient and Christopher Columbus, Lost Paradises (below) the future of classical music? Or are they just small ripples in a big pond? Only time will tell. But I haven't heard Alia Vox talking about mass redundancies, and their 2008 release schedule looks pretty healthy. Which is more than can be said for EMI. It was Philip Glass who said world music is the new classical. I should probably also have said in this article that the crowning irony is that Jordi Savall recorded for Virgin/EMI before setting up his own record label. I had not been familiar with Alia Vox; thanks for the information. I'm sure I'll visit their site again once I'm over my annoyance at their very bad website manners. First, they start playing music without any request from me over top of the Internet radio station I was listening to at the time. And second, they've set up the site so that it's unnecessarily difficult to bookmark something lower down in order to avoid the annoying music-playing intro. As easy as it could bemto just plop on a disc, I still prepare myself by reading the notes (and, thanks to my music degree, I am able to see where there is misinformation) and getting myself into a head-space.So, programme notes, like the Savall CD you mentioned, are crucial. Alas, it seems the LP age still provided more reading, and visual, material. Perhaps it's the 12 x 12 inch size. One of the best, and most informative, I've ever come across was for the only two releases in ARCHIV's Musical Traditions in Asia. Thoroughly researched by a noted ethnomusicologist (who recorded most of the music), it's a shame that ARCHIV never completed the survey and also a shame that a mere pittance of the two albums --Bali, and Java -- were issued by DG on only one CD. Here's hoping to see the entire project issued again, complete with notes and photos. David, have you had any experience with documentation supplied on a CD-ROM instead of hard copy? Brilliant Classics market the complete Tallis works I mentioned. The sleeve notes and texts are provided on a CD-ROM, and they do this with a number of their other boxes. It is a sensible compromise. It doesn't suit me as I don't keep a computer in my main listening room. But it is much better than no documentation at all. Universal, the world's biggest music company, suffered falling revenues last year despite fast growth in digital download sales and album success for Amy ­Winehouse and Mika. The record labels and music publishing business owned by French media conglomerate Vivendi said it increased market share in 2007 but revenues were down 1.7% to €4.9bn (£3.6bn) as the wider music industry continued to suffer. Once the group's acquisition of BMG Music Publishing and UK music group and merchandising business Sanctuary were taken into account revenues were up 3% on a constant currency basis. Without those new additions, revenues were down 3%, partly "reflecting a difficult music ­market". The fourth quarter taken alone was particularly tough, with revenues down 5%, excluding the acquisitions. The drop off in revenues came despite last year's strong release schedule. The record industry has been battling rampant piracy and looking for new ways to reach consumers who have grown used to paying little or nothing for music. While legal downloads have been rising they have yet to make up for falling CD sales. Figures released last week by music industry association IFPI showed global digital sales last year accounted for 15% of the entire market that was down by 10%. I have BRILLIANT CLASSICS' complete Mozart box set, which, btw. for 150+ CDs only cost me $95.00 cdn (and is, of course, NOT complete : what happened to L'oca del Cairo, and the Cadenzas to other people's concertos? Include them, and then it'll be complete, buster!). This set also includes a CD-ROM. Admittedly, I've only glanced at it, to check if it was working. I can see the green advantage of a CD-ROM : no trees had to die in the process. It is useful, though somewhat tiring on the eyes, to follow a libretto in this fashion. The trick is to have a laptop, so you can sit in the comfort of your listening chair. That also reminds me of cover art you just can't duplicate these days. The Germans used to go mad for "Weihnachtsmusik" discs, and some of the issues were quite inventive. POLYDOR issued two that stood out. One was an Adventskalendar--not a good idea to keep the chocolate so as to maintain the integrity of a complete cover! The other was a pop-up nativity scene. The real loss, what with music becoming an almost free commodity, is for the luddities like me, the collector. There is no longer an "impressibility" factor in owning a recording on a disc or tape. The ritual of going to a shop and actually socializng with people is also gone. Record stores will be extinct within the next five or so years. It is difficult to concieve just what a vast amount of music has been recorded when your visual clue for more music than you can hear in a lifetime can be stored in a compartment no bigger than your thumb! Will that lessen the impact of music, or increase it? That's hard to say for now. Am I the only one who thinks profits of 3.6 billion GBP( about $7.2 billion US) are not too shabby? Just got the 2007 royalty statement from Albany Records for this 2002 disk of my chamber music. To my surprise, they are showing I had 1.5 times as many CD sales as digital downloads last year. I would have guessed we were past that tipping point by now – by which I mean I would have thought digital downloads would be outstripping CD sales. No conclusion to draw, just a presentation of information. ...they are showing I had 1.5 times as many CD sales as digital downloads last year. I would have guessed we were past that tipping point by now – by which I mean I would have thought digital downloads would be outstripping CD sales. Well, I'm someone who has bought more downloads than physical CD's in the last year, but I'm not surprised by this at all. I suspect there's a comparison to the discussions about the effect that blogs are having on the "mainstream media." Those of use who are involved in digital downloads or blogs tend to overestimate how quickly things are changing and underestimate how many folks just aren't interested in the "new way." Example - if we accept that a broadband connection is needed to make downloading of music practical, then it's interesting to note that 50% broadband by population for any country seems to be the high end at the moment. The flip side, of course, is it looks like there's still a lot of dialup out there, and what many of us might see as a surprising number with no internet connectivity at all. 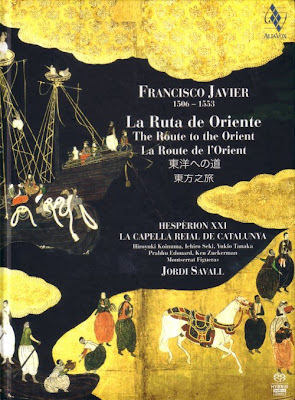 'Francisco Javier 1506-1553, the Route to the Orient' is very nice music. The 273 page book includes the text in 6 languages so the English bit is roughly 40 pages long and in very small (6pt?) type. Nice background, looks good, and cost me £24.95 from the local EMI shop. The arts have always depended on patrons, including, more recently, government. Your ticket at the concert hall (increasingly overpriced) doesn't pay for the orchestra, only the trappings. The commercial possibilities for recordings of serious music seem to be narrowing fatally. The incentive to record may eventually have to depend upon some kind of patronage, rather than sales. I'd far rather my tax dollars assisted in such efforts than in building more weapons.